This itinerary visits three of the best mountain and rock-climbing areas in Brazil. We'll begin with four days in Rio de Janeiro before moving on to the Itatiaia national park and then finally the Pedra do Bau, spending three days at each of these venues. The trip is open to those who want to rock climb and those who would rather walk or scramble, our instructors will offer alternative routes every day. Probably the best rock climbing in Brazil is in and around Rio de Janeiro. This is a city with plenty of mountains, There are steep 200m crags right by the pavements in Urca and the world famous landmark of the Cristo Redentor statue stands at the top of a peak called Corcovado. The equally famous Pao de Acucar (Sugar Loaf) peak has some stunning rock climbs on one face, but is an easy scramble around the back. 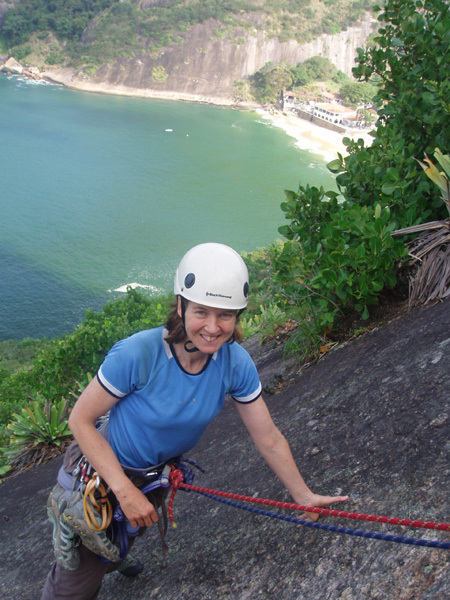 Climbing and walking in the dramatic coastal scenery and vibrant beach culture of Rio is an unforgettable experience. After our time climbing and scrambling by the beaches of Rio we will visit two of the best mountain areas in Brazil including the impressive Pedra do Bau in the scenic Serra da Mantiqueria. There are climbing routes and "via ferrata" of up to 300m long on this peak and on the neighbouring peaks of Ana Chata and the Bauzinho. Elsewhere in the mountains of Brazil there is excellent climbing and scrambling in the Itatiaia national park, including the peak of Agulhas Negras 2787m, which has both easy scrambling and harder rock climbing routes on its flank. Climbing on K2 (150m, E1 - 5.10a) one of the worlds coolest rock climbs...!. For more information on rock climbing in South America visit our Rock Climbing Information page. Stunning scenery at the Pedra do Bau, Sao Bento Sepucai, Brazil. 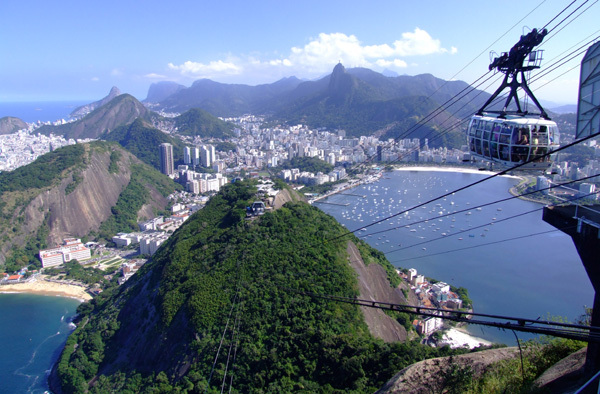 Some of the best walking and climbing in Brazil is located in and around the Olympic city of Rio de Janeiro. Rio is a stunning city with much dramatic mountain and coastal scenery and a very vibrant culture. It is an unforgettable place to spend some time walking and climbing. The standard of hotels here is very good, we usually opt for one a few blocks back from Copacabana beach to try and keep costs reasonable. For climbers there are the 200m high crags of the Morro da Babilonia, located just 15m from the pavements in Urca and more remote long routes on the far side of the famous Sugar Loaf peak (Pao de Acucar). The Pao de Acucar peak has literally a hundred excellent routes on it, and all of them have the bonus of a free descent in the cable car afterwards. Across the city the world famous landmark of the Cristo Redentor stands at the top of a peak called Corcovado which has some more excellent climbing. There are crags on several other mountains in the city. The climbing on all the crags in and around Rio is mostly on slabby granite, with all routes bolt protected, but the bolts are more "adventuous" than most sport climbing. For scramblers the famous Sugar Loaf (Pao de Acucar) peak at the entrance to the harbour has a superb scrambling route on it. Across the city are the peaks of Pedra do Gavea and Pico da Tijuca, both with excellent easy scrambles to their summits, from where there are superb views of the Atlantic beaches. The slopes of these peaks are covered in well preserved tropical forest and we will see many exotic species of birds, mammals and plants on our way up the hills, such as toucans, manikins, coatis and marmosets. We'll climb and scramble as many routes as possible at a variety of venues during our four days based here. There will also be a chance to see some of the city and its famous beaches in the afternoons when it gets too hot to climb or walk.! 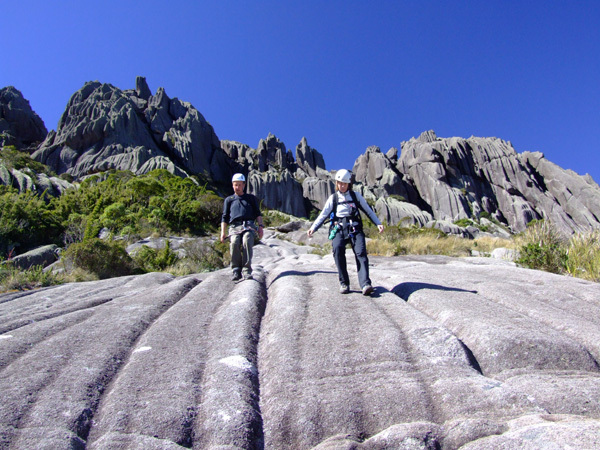 Scrambling on Agulhas Negras, Itatiaia national park . About four hours drive inland from Rio is one of Brazil's best mountain national parks. Itatiaia has many peaks over 2500m high, the majority of them with good rock climbing on their flanks but easy enough scrambles to their summits. Indeed the highest peak of Agulhas Negras, 2787m, can be climbed by a variety of long and interesting middle-grade routes as well as a classic scramble. We'll also climb on the peaks of Pedra do Altar and Prateleiras, which has a very entertaining scramble on it. The park gets quite cold at night and even very occasionally sees a little snow -- we are travelling in Brazil's winter dry season. Brazilians from nearby Sao Paulo come up every weekend to experience such unusually cold weather! While in Itatiaia we'll be staying in a fairly basic mountain hut at the entrance to the national park. 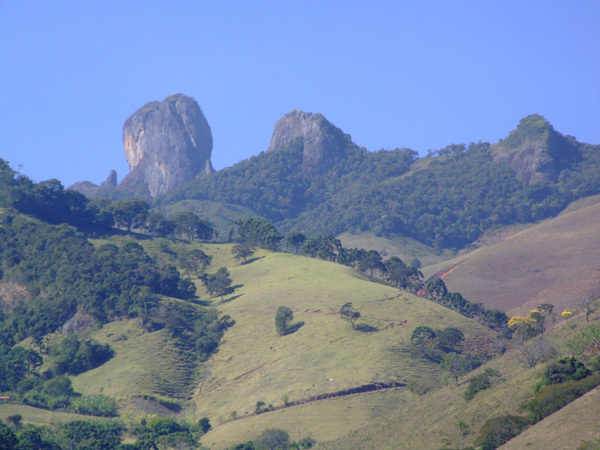 Our final destination will be the impressive rock peak of the Pedra do Bau in the Serra da Mantiqueria near Sao Paulo. This 2050m peak rises spectacularly from the forests and fields around the village of Sao Bento Sepucai. There are climbing routes of up to 300m on this peak and on the neighbouring peaks of Ana Chata and the Bauzinho. The Pedra do Bau has two stunning and exposed via ferrata on it as well. The rock is again a type of granite. While staying here we will base ourselves in the nearby village of Sao Bento Sepucai. Sao Bento is a charming wee village with many beautiful colonial style buildings set amongst rolling green hills in a rich agricultural area where cattle, coffee and bananas are raised. 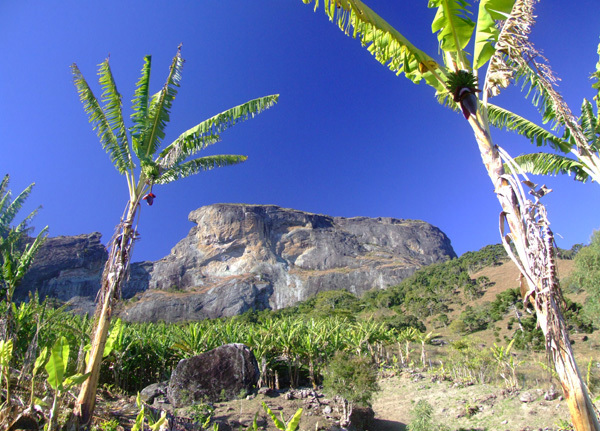 Stunning scenery near Sao Bento, featuring the Pedra do Bau and some banana trees. Climbers should ideally be experienced rock climbers who can second routes to at least Severe or Very Severe (US grades 5.6 or 5.7) comfortably. In general scramblers should be happy on grade 2 and 3 scrambles (UK) or on all 4th class terrain (US) and be comfortable with some exposure.... All climbs and scrambles will be lead and guided by us, there is no requirement to lead climb. However we should stress that there are almost endless great things to do in the mountains of Brazil, and we will tailor the trip to the aspirations and abilities of those who book, whether you want to climb, walk or scramble. And of course you can always take a day off in Rio and lie on the beach at Copacabana.! Please call or email us (contact) if you wish to discuss the suitability of this holiday for you. We travel to Brazil in the winter dry season, when the weather is also at its coolest. We can expect a lot of clear sunny days and few (if any) rainy days. On the coast temperatures regularly reach 25ºC but higher up inland, and particularly at Itatiaia, it may only be pleasantly warm (15ºC) during the day. It gets cold at night in Itatiaia with temperatures occasionally dropping below freezing. As we are in the tropics there are 12 hours of darkness each night, so bring a good book! All clients must be insured for medical costs and repatriation in an emergency We recommend having insurance for baggage, personal liability and cancellation as well. If you would like advice on insurance please ask. Brazil is one of the most developed countries in South America. Vaccinations for tetanus, typhoid, polio and hepatitis are needed, but malaria and yellow fever precautions are not necessary as we won't be visiting mosquito infested areas. Brazil is a very friendly and relatively safe country to visit but it is important to stay alert when in busy public areas and to guard your belongings carefully. Muggings and violent crime against tourists are rare. We issue further advice on security to all clients before departure. The crags and peaks of Rio as seen from the topmost cable car station on the Pao de Acucar (Sugar Loaf). Crime : Brazil (and particularly Rio) has a higher crime rate than Europe. As a wealthy tourist you may attract attention. Driving, hotels and general safety : In Brazil driving, fire safety standards and general safety standards are not as high as in Europe. In particular the driving standards are very poor! Remoteness : You will be several hours from medical help for short periods of time. Minor slips and falls : Due to steep, uneven and unstable ground in the mountains and when approaching rock climbs. Weather : The mountains of Brazil have only minor hazards associated with mountain weather, but forecasts are not as reliable. Mountain Hazards : On all scrambles, rock climbs and abseils there is always a very small risk of falls or other mistakes resulting in injury or death. In certain places you may be subjected to a slight risk of rockfall, although this is not a serious hazard. Rock climbing on the Sugar Loaf, above Praia Vermelha. Our holidays are designed to be small and flexible. The trip will be co-ordinated, organised and lead by us, but we will consult members when planning the details of the trip and aim to be as flexible as possible over your choice of climb or scramble each day. We publish an outline itinerary so that we have a framework on which to build the trip. Please note however that the leaders decisions will be final where the safety of the group or any member is in jeopardy; for example where retreat or diversion is necessary due to illness or bad weather. The minimum we need to run this course is three customers. The maximum size will be four customers plus leader(s). Copacabana beach, Rio de Janeiro, with the Sugar Loaf in the distance.